Is your car or truck’s A/C barely keeping up with the heat? Does your A/C quit blowing cold air when you’re stopped a red light? Bring your car or light truck into your local auto repair professionals, Lansdale Automotive and let us have a look at your air conditioning system. You won’t believe the number of times people stop in for a simple vehicle A/C check and end up spending more than they bargained for. 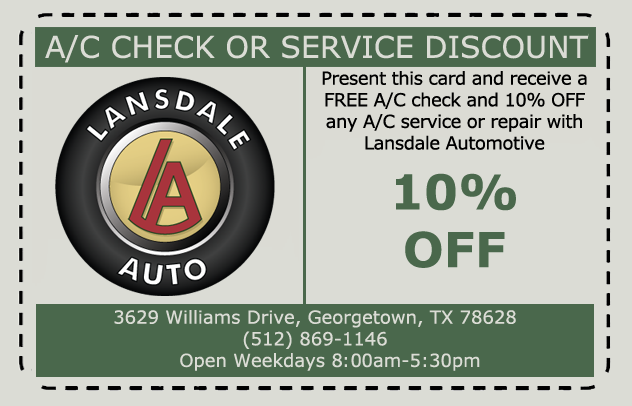 At Lansdale Automotive you won’t be pushed to buy more than you need, you’ll just get your auto A/C working right! The reason Lansdale Automotive is one of the oldest auto repair facilities in Georgetown, is because we look at all of our customers as, “Long Term Customers!” You’ll get what you need repaired, repaired the right way, without all the upsells and unnecessary “services” that you’ll get at many of the big chain repair shops and dealerships.